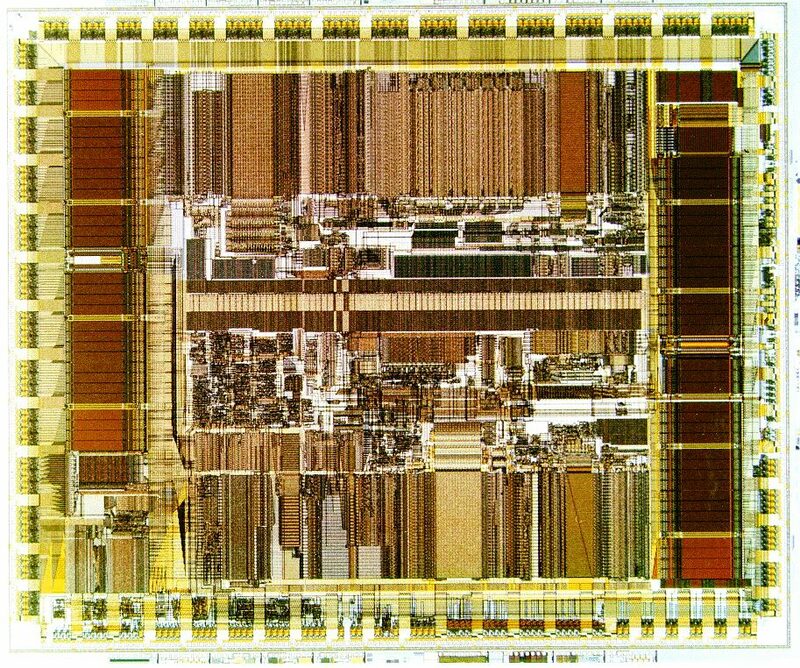 Specialty: Leading vendor of computer systems, software and peripherals from the 1960s to the 1990s including PDP minicomputers, VAX minicomputers, Alpha microprocessors, servers & workstations, & StrongARM microprocessors. 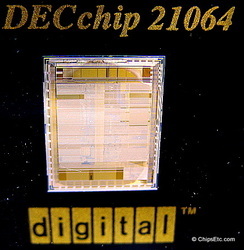 This Lucite paperweight from Digital features their very first Alpha chip, the DECchip 21064, introduced in 1992. The DECchip 21064, codenamed "EV4", was a 64-bit superscalar RISC microprocessor. It used 32 bit instructions with a built-in integer, floating point, and load/store unit, an 8 KB data cache and 8 KB instruction cache. 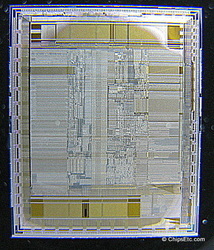 The DEC 21064 chip measured 1.39 x 1.68 cm. 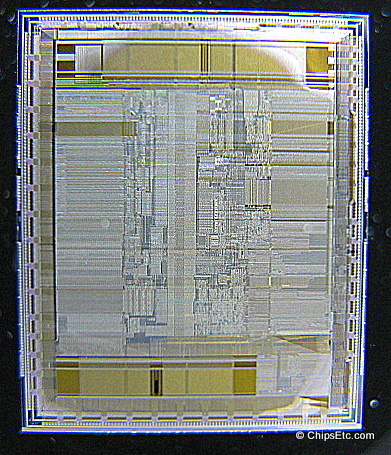 It was manufactured by DEC using CMOS technology with 0.75 micron photo lithography, had three metal layers, and contained 1.68 million transistors. 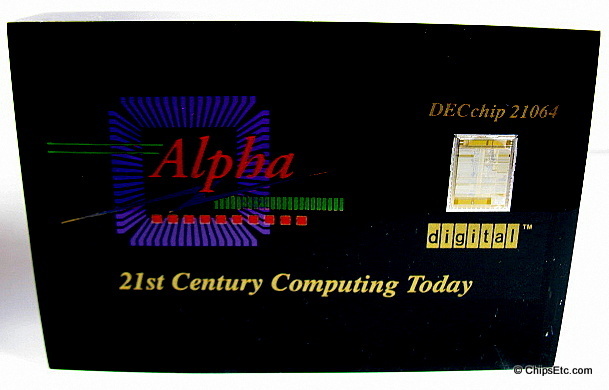 At it's introduction in 1992, the DEC Alpha 21064 was the fastest microprocessor available, running at an impressive 150 MHz. 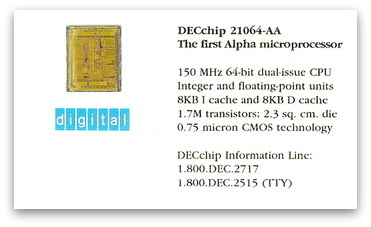 Salesman's advertising card from Digital that has an actual DEC 21064-AA 150MHz Alpha microprocessor chip laminated on the front. 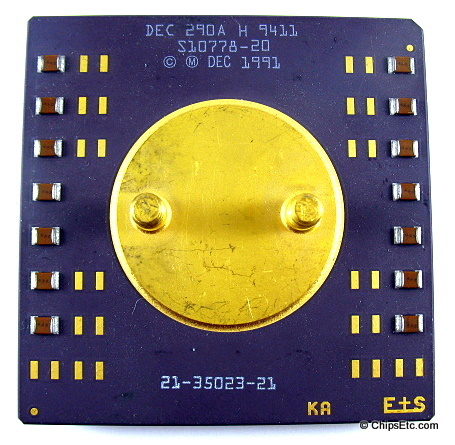 The 64-bit DEC Alpha RISC microprocessor held the title as the worlds fastest CPU throughout most of the 1990's.